I want to thank Orbit for the ARC and Hachette Audio for the ALC in exchange for an honest review, as both provided equal parts enjoyment. I also want to thank the author, RJ Barker, for giving us yet another refreshing and engaging novel in The Wounded Kingdom series. Be forewarned: This Book is Full of Antlers (sorry David Wong) and will have some spoilers for those who have not read Age of Assassins (and if you are in that group, shame on you). Some of you may know (if you follow my blog thing) that Age of Assassins (The Wounded Kingdom #1) was one of my top 5 reads of 2017. Like I said in that blog post, Orbit publishing killed it with fantasy debuts in 2017, and if Blood of Assassins is any indication of how 2018 is going to flow with sequels, we are in for a heck of a ride. Age of Assassins was my dessert course of 2017 and instantly made me a fanboy of Barker’s. Girton Club-foot is one of the most compelling young antagonists you will find in fantasy today and his relationship with his master, Merela Karn, truly takes an emotional toll on not only the characters themselves, but the reader. But enough about AOA. We are here to talk about Blood of Assassins, the highly anticipated sequel. But first, and this has to do with AoA and now BoA, hats off to Joe Jameson for another stellar performance. This man can do no wrong. I will listen to every single audiobook he narrates and nothing is going to change that. So, here we are. Over the last five (5) years, after the decisive events of Age of Assassins, Girton and his master have been traveling the Tired Lands in search of work; mostly quick jobs and objectives here and there that require their specific sets of skills and dole out pretty decent coin. During their most recent conflict on the road, Merela is poisoned and Girton must rush her back to Maniyadoc (where the events of Book 1 took place) in order to find not only help, but hope. Maniyadoc is now ruled by King Ruffra, an old friend and sparring partner of Girton’s, and lucky for Girton, has the aid he seeks. Problem is, two (2) other men from Girton’s training days in Maniyadoc believe they have rights to the throne and war is being threatened. Girton is now tasked with saving his master, helping his friend, and keeping a secret he has had these five (5) long years safely hidden deep inside himself. But when talk of a traitor suddenly makes its away around the city, Girton may be in for more than he can handle. It is always difficult, when finding yourself faced with a highly anticipated sequel, to NOT go into it with a ton of hype. As a reader, you don’t want to be let down or be left with a bad taste in your mouth should the book not turn out as you had hoped. Good news for you folks: Blood of Assassins, while maybe not as spellbinding as Age of Assassins, fits the bill and does not disappoint. Girton has grown up over the past few years, moving away from killing as an art form to more of a necessity to stay alive. He has put aside his blades and replaced them with a Warhammer for goodness sakes. Nothing says killjoy more than a freaking Warhammer. Though still foolish at times and oft makes mistakes, he is still the most loyal and trustworthy person a friend, or master, could ask for. The biggest change from AoA to BoA is the instillation of magic to Girton’s repertoire. Though he does not yet know how to wield his power, it is definitely a force to be reckoned with and we are shown through several glimpses during the course of the novel. This magic also creates a power struggle within Girton as he tries to do what is right and just, while a strange voice in the back of his mind and in his dreams forces Girton to bend to its will. All in all, mounts are some of the coolest beasts ever imagined in a fantasy story and I want one, mostly because of the antlers. 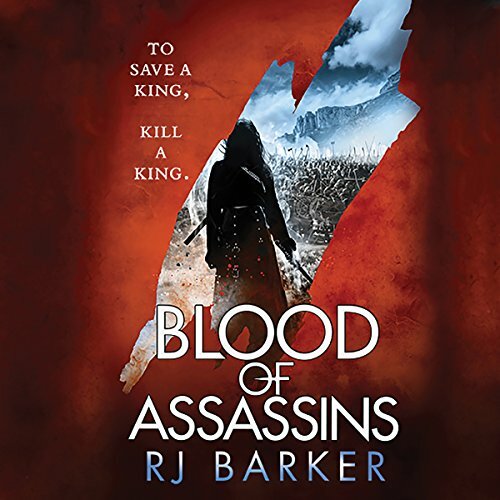 Wait… I mean, Blood of Assassins is a very worthy follow-up to its predecessor and should be one of the next books you read (only if you have read AoA, though you can kind of read it as a stand-alone I guess). And again, if you have not read AoA, I suggest you fix that immediately. I still kick myself to this day for waiting so long to read it, so maybe that’ll light a fire under you.